WCCLS Kids: ¡Hola! Bonjour! Little Pim! The Washington County Cooperative Library Services is thrilled to announce a new online language learning resource: Little Pim! 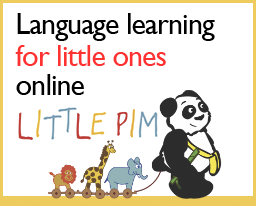 Little Pim is a cute little panda bear who guides young children through an introduction to basic foreign words and phrases in a fun online learning experience. Powered by Mango Languages, Little Pim builds upon quality early childhood language research and is specially designed for use by children ages 0-6. Available languages include: Russian, German, Arabic, Chinese, Japanese, Italian, Hebrew, English (ESL), Spanish and French. Little Pim uses an Entertainment Immersion Method® to introduce kids to familiar words and expressions. Folks who are familiar with immersion methods of language instruction will quickly recognize the style of teaching. Visual clues help to reinforce words or phrases being introduced. In addition, a considerable amount of repetition allows kids the opportunity to build mastery at their own pace. As our communities become increasing more global, we recognize that knowing a second or third language is a great asset for any child. It is with this belief that we happily offer our library users the opportunity to enjoy the joy of learning along with Little Pim! 1) The American Academy of Pediatrics makes the following recommendation: "Television and other entertainment media should be avoided for infants and children under age 2. A child's brain develops rapidly during these first years, and young children learn best by interacting with people, not screens." 2) Researchers are discovering that direct interactions are more likely to generate language learning in very young children than passive media consumption. To this end, we recommend that you enjoy Little Pim in the company of your child. That way, you can learn together and create a meaningful interaction through practice.